Murugadoss directed Surya in ‘7m Arivu,’ posters of which have gone up all over Tamilnadu in the last couple of days. 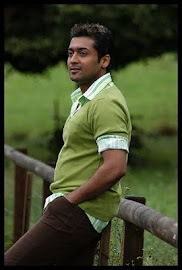 Seeing the appearance of Surya, one is eager to watch the film. Murugadoss has given an interview in Ananda Vikatan about what’s special in the film. “It was 140 days of shooting and we brought an unimaginable colorful dream, come true. One can say it’s justified grandeur. Udayanidhi Stalin was very cooperative. I have combined period film and science fiction in this film. ‘Varnam’ will definitely surprise Tamil audiences. It will make every Tamilian ask with “Do you know who I am” with pride. I have not given any over build-up. After ‘7m Arivu,’ ‘Ghajini’ will move to the background. The film has come out very well and my confidence stems from that. Going by what you say, would this be Surya’s best film of his career? This is Shruti’s first Tamil film. How has she done? What’s the reason for your success? “I like success. It’s said we should not be swayed by victory or floored by failure. I’m the reverse type. I celebrate victory and droop when I fail. If we take victory and failure alike, what’s the interest in life? One must experience both differently. Rising up after failure makes one stronger.